Camping is a relaxing and interesting activity that most people enjoy. However, when it comes to food preparing for your campground, or in the backcountry, you would spend a time to determine what cookware to bring along. 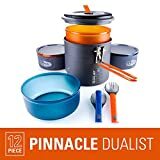 To make your decision of purchase cooking set efficiently, here are five best camping cookware that may fit your needs. Besides, you may read the buying guide to gain a right overview of cookware options. First of all, it’s important to consider whether you should buy a complete cooking set or individual pieces. Indeed, it weighs a significant impact on your pocket and camping experience. As for the cook set, it consists kitchen necessaries such as pans, pots, lids. They are specifically designed to nest together. In other extra models, the cook set would come along with cups, plates or mugs. Hence, you could put them in the pots without wasting any spare space. Since you purchase a whole set, it would save your budget considerably. However, as if you do not need some pieces, it might be more expensive. But as the smaller pieces are positioned in, the bigger cookware, it could be protected efficiently. About the individual pieces, you can freely build your set as demand. As you know exactly what you need, your cookware would be more versatile in comparison to the whole set. Meanwhile, its total weight could be heavy. As after accumulating the weight of each piece, you would deal with a rise in weight, especially when you are the backpacker. Make sure you determine beforehand what type of your intended trip. For instance, if you plan a car camping, you can stay at ease as the weight issue does not matter. It’s the same with the base camp as the multi-burner stove would be favored though it makes up space. As well as, you should consider the budget for the best camping cookware to avoid purchasing inefficiently. In contrast, a heavyweight cookware would be an obstacle for the backpacker. You would not bring a portable grill or a propane camping stove. 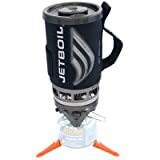 Instead, you should choose the specific backpacking stove that is not only convenient but also less relied on the heat. Likewise, when being on the rugged terrain adventure, you would require a camping cookware that is lightweight and portable. Besides, it’s necessary to know how many people in your camping group. In this way, you would choose the best camping cookware that accommodates sufficiently. Hence, the manufacturer has focused on optimizing the weight of the cooking set as light as possible. It often weighs around 85gr and attached with three moveable pot, plus a small burner. To handle the camping cookware, you should acquire all the skills and knowledge of heat control, transportation procedure, and cooking ability. For example, you need to prepare the fuel for cooking beforehand as you are not permitted to bring them on an airplane. Now, in the preparation stage, you have to control heat and conserve fuel that ensures there is the least impact on the environment. Crucially, you should prepare sufficient amount of food for a whole camping period. To save the fuel consumption, you should light the burner only after filling the pot. Likewise, you should use the flame control or any temperature equipment that comes along with your stove. Here are four types of fuels with specific cons and pros you should consider. Though it vaporizes faster than other types, it provides excellent heat. Thus, it is a reasonable choice for your winter camping. On the contrary to the white gas, these fuels are least volatile, even it provides significantly less heat. This type of fuel is cheap and safe to use. However, its smell and smoke may bother surrounding and neighborhood. These cooking fuels are useful to use in the summer while in the winter, it supplies insufficiently heat. However, you can fasten the cooking process by placing the lit on the cooking pot. As a result, the heat is kept inside to contribute to the cooking process. While the heavy cookware would shorten the cooking time, the lightweight and portable cookware is convenient to carry. Hence, you need to consider thoroughly this trade-off to choose the suitable one. First of all, this material is widely used because it is lightweight to have on the backpacking camp and its price is reasonable. Truly, if you are a budget backpacker who needs equipment to do some simple cook, this is a good choice. However, it does not retain heat well. Besides, it easily dents or scratches. And when exposed to acidic foods, it may break down. In other words, it is not reactive to certain foods. That’s why it is best used by people who like simmering to cook the meal. This is an effective and versatile choice for camping usage. Indeed, it conducts heat evenly and helps to save fuel. As it can disperse heat consistently across the surface of frypan/pot, you could cook meals with fresh ingredients efficiently. Moreover, it’s truly lightweight and user-friendly since you can pack it handily. Notably, this “Hard-anodizing” cookware is durable as there is no sign of abrasion after cooking. And you can clean it easily thanks to its thicker coating. In short, it is more enduring than the regular anodized aluminum one. And you can clean it easily thanks to its thicker coating. In short, it is more enduring than the regular anodized aluminum one. However, you should aware that due to its non-stick coating, it requires more mindful maintenance. And for such outstanding features, it would cost you extra. The titanium camping cookware that is truly ultralight. Specifically, it is 45% lighter than the steel one and tougher than the aluminum one. Due to its thin walls, it helps you boil water without slowly waiting for the heat transferring. And its durability is admired by many users. However, it disperses heat unevenly. There would be spots unheated, while others are at a high temperature. Besides, it would cost you harshly. That’s why, if you belong to the fast and light group, you should opt for this one. This is by far the most scratch-resistant and durable material though the food may tend to stick to its stainless-steel base. However, you can clean it at ease with a steel wool. Besides, some user worries about its uneven heat conduction as there is often burned food when cooking in this stainless-steel cookware. Additionally, it is quite heavier than the hard-anodized aluminum cookware. Hence, the travelers who travels roughly and get used with bringing hard gear can use it without an annoyance. The cast iron pot is one of my favorite camping cooking essentials as it is durable and cooks evenly. You can use it for your daily cooking at home or at the car camping. Truly, due to its heavy and large size, it perfectly suits the car camping. Importantly, as for its non-stick surface, its durability is appreciated by many users. For this reason, you need to re-season it properly to maintain its initial surface. Overall, it might not be a suitable option for the backpacker because of its heavy weight. As it is named, you can clean it without a hassle. Remarkably, it does not require you to put more cooking oil while cooking. However, you may struggle to keep it intact without a sign of scratches as it easily breaks down. Hence, you should not use the metal utensil to cook. I suggest this camping cookware with the non-stick coating should be used for the car camping. Regarding this material, you would be amazed at its lightweight and an affordable price. It is needless to worry about the scratch issue as your camping cookware is made from the non-abrasive material. Moreover, it would please you as it can remove an odor of food completely after washing. Additionally, it would be a great option to contain an air-tight food. In short, the backpacker would find the plastic cookware useful. However, its durability and heat-resistant are not guaranteed strongly. After acquiring information about how to determine your camping cookware’s material that suits your condition, you need to acknowledge the safety concern. Indeed, this important step would ensure your safety and your trip’s smooth experience. May you know about this synthetic compound and how its effect negatively on your health? Almost all the nearly expired cookware would pose threatening health risks. To avoid it, make sure you contain or cook food in the BPA-free accredited cookware. Besides, the items are sold by Recreational Equipment Inc. (REI) guarantee you that they are safe to use. Though the nonstick coatings are truly assistive to clean, it could risk your health if you do not take it carefully. Specifically, when food is overcooked, your cookware that is coated with food-grade fluoropolymer PTFE would emit toxic fumes. And after inhaling it, you are likely to suffer some flu-like symptom. That’s why you should not boil food in the nonstick-coated cookware. There are few people still confuse about whether it’s risky to use aluminum cookware. Seriously, according to the National Institutes of Health and the London-based Alzheimer’s Society, it is confirmed to have no health- related risks involved in using aluminum frypans/pots. Instead, it only effects on your meal’s flavor. Obviously, you need to prepare enough pots and pans to meet the size of your camping party. As for a packaging party, one single pot for two people is enough for a simple meal. Meanwhile, for a larger group, you would need a larger set due to the extensive meals’ requirement. The larger and flatter surface of the pot, the more efficient the heat conduction. That’s why the pot/fry pan with the wider diameter would be exposed to the flame quickly, resulting in the faster heat transfer. Besides, the color also plays a decisive role. Particularly, the pot/fry pan with dark bottom would much more efficient than the new one. To sum up, you should pick the moderately old cookware that fits the diameter of the burner most. Do you know that lid can help to reduce the cooking time? Indeed, by placing the lid on the pot, it can preserve and supply sufficiently the heat for cooking. Besides, you can save much space as there are many lids designed to fit different-sized pots. Hence, it’s unessential to bring every single lid. Moreover, you can use lids as plates, or strainers. Remarkably, you can double it to have a frypan right away. Overall, the handy lid will significantly lighten your load. How to pick up your posts and pans safely is a worth considering step. Make sure you pack enough grippers that are used in conjunction with your pot. It would be a removable or a lock handle. In the market, there are many useful handles allowing you to lift the pot without gripping it continuously as the handle lock on your pot. Take care of yourself to avoid the risk of fire. Specifically, you need to maintain the flare smaller than the pot’s diameter. Besides acquiring how many people you will cook for, you need to determine where and how long you are going to camp. In this way, you will bring a sufficient number of the knife, spoon, fork and other serving essentials (spoon, spatula, etc.). Also, if you keen on canned meals or dehydrated food, then it’s needless to bring too many extras. Moreover, there is a handy spoon/fork combo which is versatile for your camping use. Thus, to finalize your cooking set preparation, make sure you have bowls, pots pans, utensils, mugs. Then, you keep considering what else is needed to prepare for cooking to avoid redundancy and heavy backpacking. Some people would be tired when coming to the cooking cleanup, and honestly, who would not? However, this is a necessary activity to preserve your cookware’s longevity. That’s why you need to pack enough soft tower or specific soap for cleaning. Remember to clean the nonstick-coated frypan/pot gently to not scratch its bottom. Weight 0.875 lbs. 1.3 lbs. 1.8 lbs. 1.5 lbs. 13 lbs. If you are a solo traveler, this one definitely is for you. This lightweight Flash single compact (14 oz.) comprises a 1-liter FluxRing cooking vessel and stainless-steel burner. Importantly, it is easy to use as you only need to fill water in two provided cups and boil them for two minutes. If you are a careful person, you can filter water before boiling. Then, you can enjoy your hot coffee. This FluxRing cooking cup has the burner and fuel canister tripod to avoid accidental spills and keep the unit stable while cooking. Moreover, there is a color-changing heat indicator to notify when it is hot. And honestly, I like its amazing neoprene lining within the cups as it keeps my beverage warm. Additionally, you would be impressed at its built-in windscreen because it helps the flame sustain during inclement weather. Furthermore, there are other support features such as a drink-through lid, an insulating measuring cup or a pushbutton. The lash is super lightweight and compact to go on long hikes, camping or any outdoor activities. Perfectly matches the user who only needs to rehydrate frozen dried food or water. Takes just two minutes to boil 32 oz. of water. It provides many necessary necessities that help user’s experience efficiently. It requires extra care and precaution when using in cold conditions. 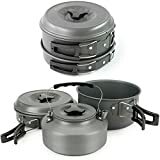 This camping cookware set includes two durable pots, lid/frypan, which are truly lightweight (10 oz.). That’s why it fits various types of camping. Besides, its durability and versatility are worth-admiring factors. Indeed, you can use its lid as a plate. Besides, it is made from stainless steel that enhances its durability considerably. Additionally, it boosts your cooking efficiency thanks to its rounded corner design that directs heat goes up sides of pot faster. Importantly, most stoves can nest within pots. Hence, its compatibility can save your pack room. The whole sets are dent and scratch-resistant that are able to endure most of the rugged conditions. As its pieces can nestle together, there are many positive reviews about its excellent compact and lightweight. Users like how it helps them boil water or cook meal quickly. There are some complaints about its versatility as it hardly enables users to fry. This camp cook set is perfectly suitable for the backpacker as it comes in full accommodation for two people. In specific, there are two insulated mugs, two sip-it lids, a two-liter pot, and two bowls, plus a pot gripper, a stuff sack, and a frypan. Especially, they are designed to be positioned neatly within others. As a result, they are lightweight and packable to carry. Importantly, its pot and frypan are made of hard-anodized aluminum that can conduct and contribute heat consistently. Moreover, it features the Teflon® Radiance technology with a scratch-resistant surface. Due to this effective material, the pan can disperse heat efficiently. Additionally, you can use metal utensil when cooking in these items. In case you worry about its health guarantee, its BPA-free plastic pot lit would ensure there are no health effects. And it highlights its integrated strainer that helps you handle the vegetable or pasta steaming conveniently. There are some positive feedbacks about its great endurance of high temperature. Does not only impact resistance but also remove the odor of food after washing. Has a great function in distributing heat. It provides BPA-free plastic mugs that can nest within pots to save your space. Besides, it is offered with a color called mug and bowl to differentiate yours with others. There are EVA foams that keep the drink hot and prevent its spills. Importantly, both left-hand and right-hand users are comfortable with this compact mug shape. Many users appreciate this durable and lightweight pot/frypan. You need to take extra care when cooking as it tends to be scratched with super metal utensils. This is another cookware that many backpackers count on to carry on their trip as for its lightweight (1.5lbs). Also, the small pieces could be kept in the larger size items for your convenience. Besides, they are constituted from light and solid aluminum oxide. For this reason, they can withstand high temperature effectively and ensure no stretches left. Noticeably, each item’s surface is constructed with a non-stick Teflon coat. Hence, it greatly contributes to the cookware’s durability. Consequently, you can clean them handily. Personal speaking, I am interested in the teapot that comes along in the Winterval camping cookware. It is such an ideal essential during winter mornings and cold nights as I can boil water quickly to enjoy my beverage. Many people suggest it as the great value cookware with the obvious lightweight to have on a light adventure. It is durable to use for a long time. It offers 11 camping cooking essentials that satisfy most of the user’s needs. Its fry pan, tea kettle and the pot are friction-resistant and high-temperature. The bowl is relatively small to match the camper’s needs. Few users complain that there are some items unnecessary for their camping cooking. As for its bulky size and various types of cooking essentials, it best suits for the RVs camping. 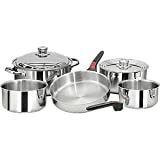 Particularly, it provides three sauce pans and a frypan with interchangeable lids. It also provides storage cord and two removable handles alongside. Importantly, they are made from stainless steel with triple-clad encapsulated bottom. For this reason, it can distribute heat evenly. However, it is not recommended to use with induction cooktops. Instead, this is safe to use with oven and dishwasher. Additionally, it offers you roughly ½ cubic foot cabinet space to cook a full meal. Besides, you are provided a one-year warranty by the manufacturer. Many users highly value its indestructible durability. It provides the camper a sufficient number of cooking essentials. Its stainless-steel material gains the user’s faith in their functionality and health risk-free features. You might face with an annoying odor or hardly scrub on its bottom when cleaning. They are heavy to take on the backpacking camping. In short, you need to answer three questions beforehand consisting where and how long you plan to camp, and how many people you would cook for. After acquiring exact information, you can determine which type and how many camping cookware to choose. Keep in mind to maintain your set properly. Also, you should carefully preserve environment surroundings. Hope you make a wise decision of the best camping cookware and have a smooth camping experience!